Born in Beijing and now based in the U.K., Xuefei Yang is acclaimed as one of the world’s finest classical guitarists. Born following the Cultural Revolution, an era where Western music and instruments were banned, the fascinating story of Fei’s rise to the world stage is that of a musical pioneer. She was the first-ever guitarist in China to enter a music school, and became the first to launch an international professional career. Prodigious musical talent was evident at all stages. Her first public appearance at the age of ten, at the China International Guitar Festival, received such acclaim that the Spanish Ambassador in China immediately presented her with a concert guitar. The composer Rodrigo attended her debut concert in Madrid when she was fourteen and, in 1995, when John Williams came to Beijing, he was so impressed with her playing that he gave two of his own Smallman guitars to her Conservatory, especially for Fei and other top students to play. She was the first Chinese student to be awarded a full international scholarship to the Royal Academy of Music in London, and was honored with the Principal’s Prize. As a professional musician, she has performed concerts in forty countries throughout the Europe, Asia and North America. The demand for her music sees Fei keeping a busy international schedule including London’s major venues (with several sell-out recitals at London’s Wigmore Hall), and concerts at the world’s most prestigious venues. In 2012 Xuefei received the honour of being made a Fellow of the Royal Academy of Music. This honour is held by at most 300 people at any one time. In 2005 The Royal Academy acknowledged Xuefei’s musical achievements when she was made an Associate of the Royal Academy of Music. 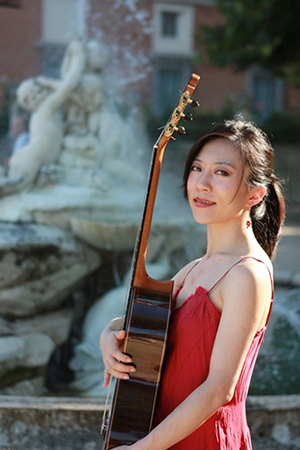 Off-stage, Fei is actively expanding the guitar repertoire, with her own arrangements of pieces (with a particular interest in both adding Chinese music to the repertoire, and making significant contributions to the guitar’s concerto repertoire), and collaborations with composers (in particular a close collaboration with British composer Stephen Goss). The result is several substantial and exciting new works for the instrument, which have found their way onto the concert stage, and into the recording studio. Fei has an exclusive international recording contract with EMI Classics. Her EMI debut album, Romance de Amor, achieved gold disc status in Hong Kong, and her second, 40 Degrees North, featuring music from Spain and China, was chosen as Best Instrumental CD of 2008 by Canton Radio station in China, and Editor’s Choice in Gramophone magazine. Her third CD recorded with the Barcelona Symphony Orchestra and featuring Rodrigo’s Concierto de Aranjuez topped the classical music charts in New Zealand. Fei’s fourth CD, of Bach Concertos, was released in February 2012. It is Xuefei’s most innovative recording yet. It features her own transcriptions of the music of J. S.Bach, both solo pieces and concertos (recorded with the Elias String Quartet). Xuefei hopes that these will represent a signification contribution to the baroque concerto repertoire for guitar.